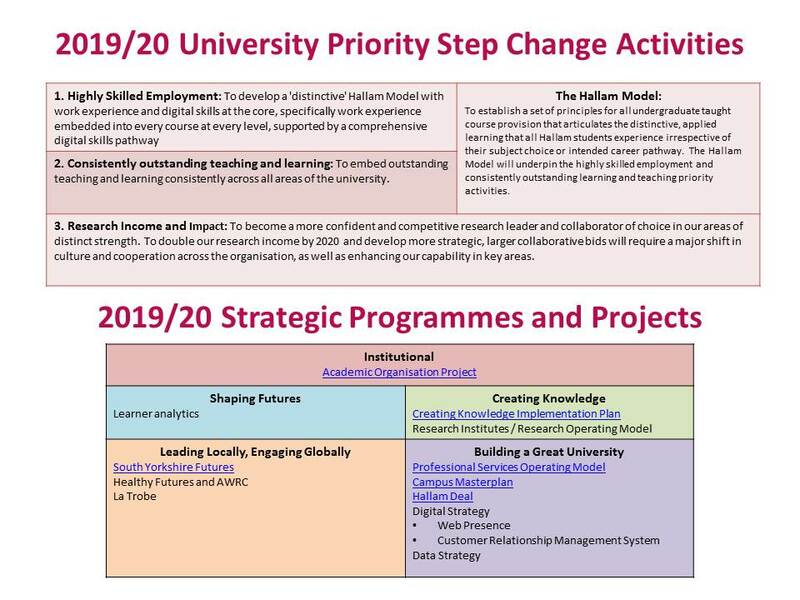 The 2019/20 Strategic Planning process is now underway across the University, with a clear set of priorities that provide a steer for focus in key areas of delivery. We begin the planning process in a period of significant uncertainty in our external environment. Some issues are unlikely to be resolved quickly – the recommendations, and any resultant implementation, from the Post-18 Education and Funding Review, and the impact of Brexit. We are also facing some known challenges: the demographic changes in the population of 18-year olds, increasing competition in the HE sector, ongoing pay inflation against a flat Undergraduate tuition fee, a dramatic increase in pension costs, and the new regulatory environment of the Office for Students. In this context, we are taking a different approach to planning, and in particular to build sufficient agility into our plans to be able to respond more quickly to changes that may occur over the period ahead. Our Transforming Lives Strategy and Vision remains the central focus for our planning. We must continue to pursue quality and distinctiveness, and to plan for the things we can control. 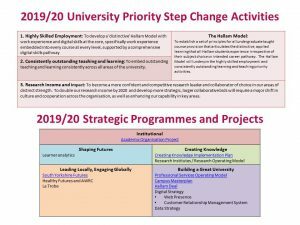 The University Leadership Team has recently agreed our step-change priorities which form the core of the strategic steer. 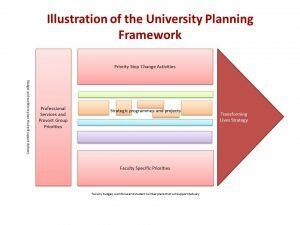 A University Planning Framework has been developed to provide consistency for business unit plans, in order to ensure a one University approach and that all our plans align to deliver Transforming Lives. Over the next few weeks initial objectives and financial targets will be developed locally with templates and guidance provided by Strategy, Planning and Insight. Final plans will be submitted in spring and we will seek Board of Governors approval in summer. It is important that we all, through our local teams and in our day to day roles, take shared responsibility and ownership for ensuring our University is sustainable and efficient, with the drive and ambition to realise our vision to be the world’s leading applied university.